Bikaner is located in the northern part of Rajasthan and lies 316 kms from Jaipur, 240 km from Jodhpur and 330 km from and Jaisalmer. The desert city shares its boundary with Jaisalmer, Jodhpur, Nagaur and even Pakistan. The deserts fascinate from a distance but it is only the true lovers of sun and sand who make it their homes and create miracles smack in the middle of the dry arid land mass. The city Bikaner narrates a similar tales of hardship and bravery of the founder, Rao Bikaji, a descendant of Rao Jodhaji. The city of Bikaner was founded in 1488 from Jangaldesh or the country of wild bushes. It has been almost 550 years since its inception and the city has spread across the desert and has also acquired expertise viz, camel breeding and dry irrigation which is unique to it. Bikaner city alongwith its rocky scrubland, is located on an elevated plain in the desert. The old city is encompassed by a long embattlement wall which intermittently breaks to give way to five huge gates. Now a major trade center for wool, building stones, carpets, blankets, salt and grain, Bikaner has emerged as the lifeline of the state. In 1488 AD, Rao Bika Ji chose an infertile land under Jodhpur province called “Jungladesh” and shaped it into an impressive city, called Bikaner. It took more than 30 years for Rao Bika to stabilize Bikaner as there were regular attacks on the newly formed state by desert invaders. History explains that Bikaner was continuously locked in combats with the Mughal Empire, but later forged a friendship with Emperor Akbar. But with the decline of the Mughal reign, the city of Bikaner suffered another setback. Afterwards, the rulers of Bikaner later signed a pact with the British and remained loyal to them till it was merged with the other princely states to form the state of Rajasthan. Ultimately it became a part of the republic of India after the Indian independence. Positioned at a height of 228 m, the city of Bikaner experiences a typically desert climate. During summer, the weather of Bikaner is quite hot. The normal temperature in summers falls in average in the range of 41.8° C to 28.0° C. In winters, the weather of Bikaner is quite pleasant and tourist is recommended to visit Bikaner during this time. The standard temperature in the winter season falls in the range of 23.2° C to 5.0° C. Regarding the climatic conditions of Bikaner, Rajasthan in the monsoon season, the rainfall averages between 26 cm and 44 cm. The best time to visit the city of Bikaner is period of October to February. Weather remains usually in typically extreme form. It is either extreme hot or too cold. Junagarh Fort: Bikaner Trip is incomplete without paying a visit to the assailable Fort. This Fort was built by Raja Rai Singh in 1593. 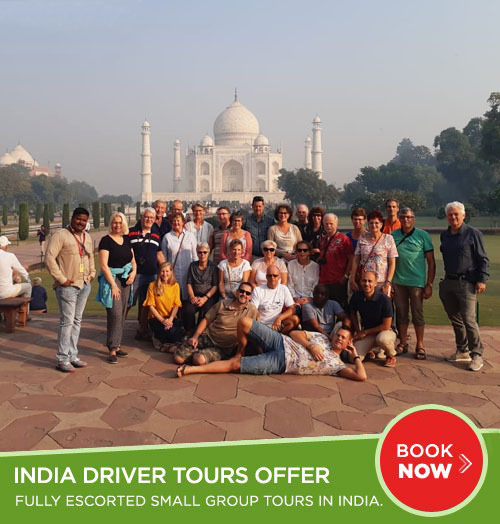 We arrange India tour package suiting your budget and expectations. With us, avail best India Tour packages, and visit Rajasthan India tour, and Junagarh Fort. 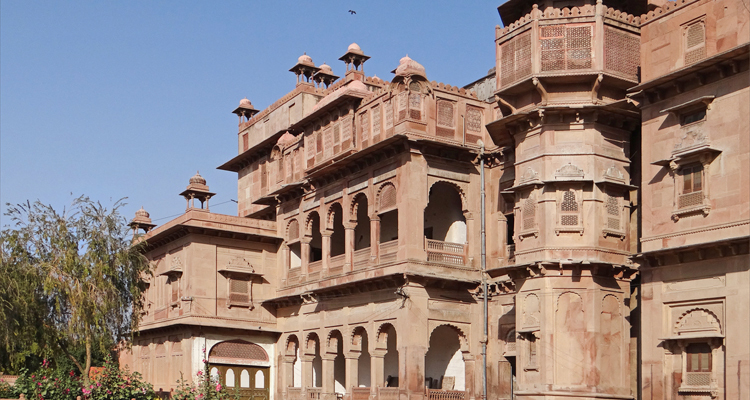 This Bikaner fort is called an unassailable fortress as it is never been conquered by anyone. Junagarh Fort has some worth-watching palaces like Rang Mahal, Anup Mahal and Ganga Niwas which are quite exciting and enchanting. This fort is well-maintained and preserved with awesome museum of weapons, artifacts and artillery. Lal garh Palace: Built by Maharaja Ganga Singh, Lal garh Palace is a worthwhile place to visit. Built in the memory of, Maharaja Lall Singh, father of Mr Maharaja Ganga Singh, this place is a fusion of European, Rajput and Mughal architecture. In this place, the royal family still lives while rest of the hotel has been used and developed into a hotel. Lal garh Palace is also a hub of exquisite paintings and hunting trophies. Ganga Golden Jubilee Museum: If you want to see the awesome collection of paintings, pottery, carpets, arts and crafts, Terracotta and ancient weaponry of Harrapan as well as early Gupta period then your search rests here in this wonderful and well-maintained Ganga Golden Jubilee Museum. This museum is known as the best museum as far as archaeological discoveries from both Harrapan and early Gupta period is concerned. Bhandasar Jain Temple: This temple is beautifully carved in white marble and red sandstone. This temple was built near about in 1544 AD by Bhandeshwar and Sandehswar. This temple is the oldest structure in whole Biakaner. Bhandasar Jain Temple is famous for its impressive carvings, astonishing wall paintings, commendable gold leaf paintings and rich mirror work. Bhandeshwar & Sandeshwar Temples: Of aesthetic heritage, Bhandeshwar & Sandeshwar Temples are the oldest and most famous monuments in Bikaner. These temples are constructed by two brothers Bhandeshwar & Sandeshwar which were named after them. Bhandeshwar & Sandeshwar Temples are famous for their impressive carvings, astonishing wall paintings, admirable gold leaf paintings and rich mirror work. Devi Kund: Devi Kund is the royal crematorium of Bikaner ruling family. Situated at a distance of 8 kms from Bikaner, the chhatri of the royal house is neatly arranged in architectural style. Every chhatri is made in the memory of the royal rules of Bikaji dynasty where they were royally cremated. They lend an impressive look and are made of white marble rendering it interesting look. Gajner Wild Life Sanctuary: Gajner Wild Life Sanctuary is most common places in the city. Lush with greenery, it renders enchanting look to the visitors. It is covered by lakes and wooded hills. Here in this wild life sanctuary, one can feasibly spot a Wild Boar, Black Buck, Blue Bull, Chinkara and Sand Grouse. This place has a lot of historical importance as well. In ancient time Maharajas used to hunt wild animals. Now, this place is currently used for safeguarding wild animals. Samadhis: Samadhi is a place situated at the bank of Devikund. Here in Samadhis several Chattries built by Bikaner’s Maharajas can be seen. Chhatri of Maharaja Anup Singh and Maharaja Karan Singh are quite impressive and superior. By Air: The nearest airport is Jodhpur which is 240 kms from Bikaner. By Train: The Indian Railways connects Bikaner with cities like Delhi, Calcutta, Agra, Jaipur, Allahabad etc. The gorgeous ‘Palace on wheels’ also covers Bikaner in its eight-day tour of Rajasthan. By Road: Though the unfriendly desert sands surround Bikaner but the city is well connected by roads. There are local and inter-state bus services plying for Bikaner from all the major cities.